The FF756 is a UV / IR² flame detector in a flame proof housing. UV / IR² models have execellent response to flame while providing immunity to extraneous sources. New micro-processor technology makes the detectors independent of flame intensity enabling it to operate through smoke, a layer of oil, dust, or water vapor. A high and low sensitivity setting according to EN54-10 is provided. inputs are available to activate self-test. A stainless steel adjustable bracket and weather shield is also available. The units are tolerant to vibration, and wind does not affect the performance. The IR² unit has excellent tolerance to detector window contamination and can detect flame through glass windows. 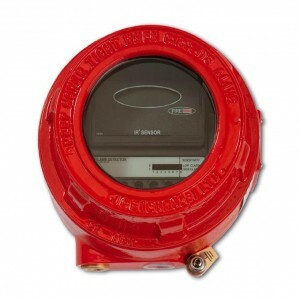 A flame sensor test unit is available for accurate testing of the detectors. Most IR flame sensors respond to 4.3 m light, emitted by hydrocarbon flames. By responding to 1.0 to 2.7 m light emitted by every fire, all flickering flames can be detected. Gas fires not visible to the naked eye e.g. hydrogen may also be detected. The combination of UV and IR² detection, plus signal processing allows the UV / IR² sensor to be used without risk of false alarms in difficult situations characterised factors such as flickering blackbody radiation or arc welding. The combination of filters and signal processing allows the sensor to be used without risk of false alarms in difficult situations characterised by factors such as flickering sunlight.